East Barnet School is a 1350 place specialist Technology School. Frank Shaw Associates designs for East Barnet School combine the existing two site school onto one site. The building achieved high standards of energy efficiency and a ‘Very Good’ environmental BREEAM rating. To reduce the building’s carbon footprint, it is naturally ventilated and has a very good level of natural daylight. Over 10% of its energy needs are met from renewable energy sources through the use of biomass boilers. 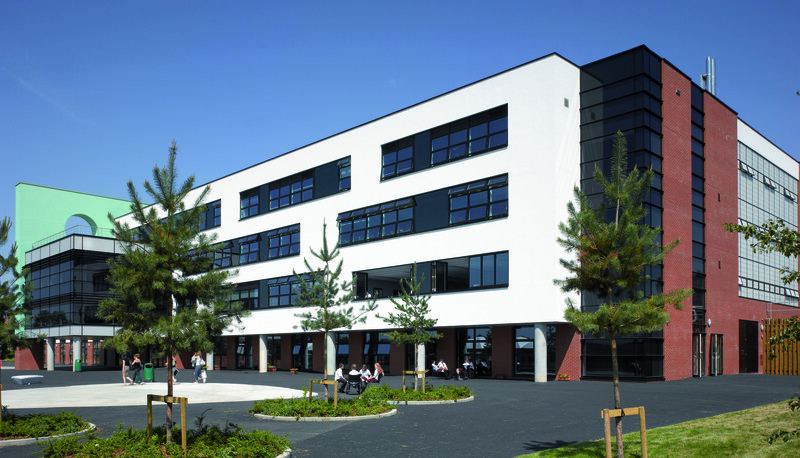 The school has been designed as a landmark within East Barnet, yet respects its surroundings through its proportions and sympathetic use of materials. It takes advantage of panoramic views over London and benefits from being built on a prominent south-facing site. The school is part of Project Faraday, a national programme to create exemplary approaches to teaching Science and to create new opportunities for Science to be incorporated into the wider curriculum. The new building supports this in a state of the Art Science laboratories and integrated interactive experiments.